Let’s talk about the right way to start your day. I know mornings can be busy and hectic, but taking time to make sure you have a well rounded breakfast prepares you to take on the day with vigor! I’m sure you know the importance of eating breakfast in the morning. I can’t tell you how often as a Registered Dietitian I hear “I’m just not hungry in the morning”, “I’m too busy getting the kids out the door to school”, or “I just don’t have time”. If you’re trying to lose weight, would like to keep your metabolism up, want to avoid cravings or poor food choices throughout the day you might want to sit down and think about making a commitment to improving your breakfast routine. Eating breakfast has been well documented to improve concentration, jumpstart your metabolism, and lead to better food choices during the day! At first even if it’s just a few bites of cottage cheese, an apple or banana. If you are going from eating no breakfast at all, then this small change can make for an easier transition. Breakfast to fuel your brain. Research has shown that starting your day with breakfast helps you gain better focus and attention, improve short-term memory, and maintain concentration. There especially has been a large body of research looking at the value of breakfast in school age children. The layout a correlation between breakfast and improved test scores. For me those are all great incentives to make sure I’m making the time to eat a well balanced breakfast. Jumpstart your metabolism with breakfast. When you fall asleep your body goes into an ‘idle’ mode. During that state of rest your body doesn’t need to burn calories for energy. When you wake the longer you delay breakfast you delay your metabolism. Putting food in the “tank” revs up your metabolism since your body needs energy to digest and process that food. Breakfast to reduce cravings. Cravings. It goes without saying we’ve all faced cravings during the day. 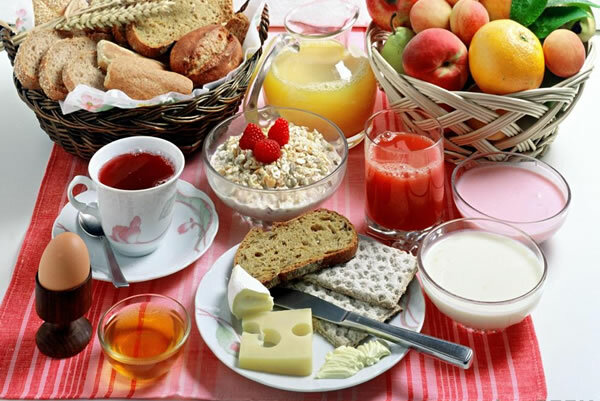 If you start your day with a healthy breakfast you’ll be less likely to experience them. A researcher evaluated the impact of breakfast on satiety and reducing hunger throughout the day. Leidy and colleagues took MRI images to monitor brain signals and found that those who ate a protein-rich breakfast had reduced brain signals that controlled reward-driven eating behavior. This demonstrated the relationship between a healthy breakfast and reduced cravings. Starting your day with a donut is not the answer to that question. If you’re skipping meals or not eating at all as I suggested earlier start with something small. After you’ve mastered consistency for a week or two put your sights on an ideal breakfast. A healthy mix of protein, healthy fat, and complex carbohydrates make for a balanced way to start your day. You carb conscious folks don’t want to cut out carbohydrates completely. A complex high fiber carbohydrate will play a role in giving you the energy you need to begin your day and keep you full longer. Protein power. I would say from experience one of the most difficult things to do is get an adequate amount of protein into my breakfast. Though it’s proving to be one of the most important components to make sure you have. Researchers published a study in January 2013 looking at the impact of eating a protein packed breakfast versus a modest amount. Specifically looking at 13 grams compared to 35 grams. Both breakfast options elicited feelings of fullness and lower levels of hunger throughout the morning. The higher protein breakfast kept hunger at bay and reduced intake throughout the entire day. It’s not completely conclusive as this was a small study conducted in young females, but does provide one more reason to improve how you start your morning! Five minutes is all you need to put together a healthy breakfast. Set your alarm 5 minutes early to make the time to prepare your meal if you need to take it to-go. Or prepare the night ahead so you can easily throw it together and savor in the morning. As you can see with the information we have briefly sifted through today taking the time to avoid the morning rush with only a cup of coffee or tea in hand is well worth it. Make sure to fuel your body so you can take on the day vigor!